All the articles published in this issue have their origin in the 2nd CompMusic workshop that took place in Istanbul (Turkey) on July 12th and 13th 2012. The workshop included 28 talks, most of them on research carried out within CompMusic but it also had presentations by other researchers working on topics of relevance to the project. After the workshop, the scientific committee (Preeti Rao, Hema Murthy, Bariş Bozkurt and Xavier Serra) made a selection of the best presentations and the authors were asked to write and submit extended articles to this special issue. After another review and selection process the eight papers of the JNMR issue where chosen. [Introduction] X. Serra. "Computational Approaches to the Art Music Traditions of India and Turkey". B. Bozkurt, R. Ayangil, and A. Holzapfel. 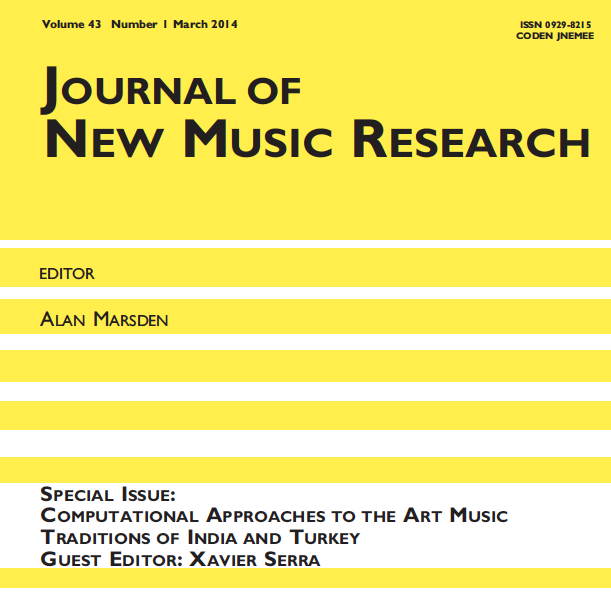 "Computational Analysis of Turkish Makam Music: Review of State-of-the-Art and Challenges". S. Rao and P. Rao. "An Overview of Hindustani Music in the Context of Computational Musicology". S. Sentürk, A. Holzapfel, and X. Serra. "Linking Scores and Audio Recordings in Makam Music of Turkey". S. Gulati, A. Bellur, J. Salamon, Ranjani H.G., V. Ishwar, H. A. Murthy and X. Serra. "Automatic Tonic Identification in Indian Art Music: Approaches and Evaluation". G. K. Koduri, V. Ishwar, J. Serrà, and X. Serra. "Intonation Analysis of Ragas in Carnatic music". A. Srinivasamurthy, A. Holzapfel, and X. Serra. "In Search of Automatic Rhythm Analysis Methods for Turkish and Indian Art Music". P. Rao, J. Ch. Ross, K. K. Ganguli, V. Pandit, V. Ishwar, A. Bellur, and H. A. Murthy. "Classification of Melodic Motifs in Raga Music with Time-series Matching". E. Ünal, B. Bozkurt, and M. K. Karaosmanoglu. "A Hierarchical Approach to Makam Classification of Turkish Makam Music, Using Symbolic Data". It is a quite long issue, 146 pages! !, which means that we have been able to expand quite well all the topics covered. I am greatfull to the JNMR editor, Alan Marsden, for having allowed this extended length. The articles cover work done in CompMusic on the Turkish-makam, Hindustani and Carnatic music traditions. With respect to Turkish makam music, the article by B. Bozkurt, R. Ayangil, A. Holzapfel reviews the musical concepts of relevance to computational work and summarizes the state of the art and current challenges related to that. The article by E. Unal, B. Bozkurt and M. K. Karaosmanoğlu is a contribution to the melodic analysis of makam music by using a large and representative collection of machine-readable musical scores and proposing a method for the classification of makams. The article by S. Şentürk, A. Holzapfel and X. Serra focuses on the linking musically relevant sections of scores and audio recordings, two needed complementary sources of information of relevance to study melodic and rhythmic aspects of this music. Finally the article by A. Srinivasamurthy, A. Holzapfel and X. Serra presents their research on the analysis of rhythm from audio recordings for both makam and Indian music. It evaluates current methodologies used in MIR for different rhythm description tasks, identifying their shortcoming and justifying the need for developing specific methods to analyze these musics. With respect to the Hindustani and Carnatic traditions, the article by S. Rao and P. Rao offers an excellent musicological and computational perspective to Hindustani music, reviewing the musical concepts mainly related to the melodic aspects of this music tradition and identifying relevant research problems to be addressed computationally. The article by S. Gulati, A. Bellur, J. Salamon, Ranjani H. G., V. Ishwar and X. Serra is a comprehensive overview of all the research done on tonic identification specific for indian music, doing a comparative evaluation of all the existing approaches. The article by G. K. Koduri, J. Serrà and X. Serra studies the issue of intonation specific for Carnatic music, developing representations with which to compare ragas in this tradition. Finally the article by P. Rao, J. Ch. Ross, K. K. Ganguli, V. Pandit, V. Ishwar, A. Bellur and H. Murthy is an initial attempt at analyzing melodic motives in Indian art music, proposing appropriate representations for them and identifying problems to be worked on. It took a while to put together this special issue, one year and a half, but the result was worth the effort and the time that all the authors had to put into it. I hope the articles will be read by the researchers working in these topics and they can offer some new understanding and insights into these three great music traditions of the world.